His work utilizes guitar and notebook computers to make multilayered compositions that blend melody and treated samples with techno-influenced production. Fennesz first received widespread recognition for his 2001 album Endless Summer, released on Mego Records. and has collaborated with a number of artists, including Ryuichi Sakamoto, Jim O'Rourke, Ulver, David Sylvian, and King Midas Sound. Noveller is the solo electric guitar project of Brooklyn-based composer and filmmaker Sarah Lipstate. to conceive of how it’s housed in a single instrument manipulated by a solitary performer. Noveller has toured with Iggy Pop, St. Vincent, Radiolab, Xiu Xiu, the Jesus Lizard, U.S. Girls, & Aidan Baker. Lipstate has also participated in Rhys Chatham’s Guitar Army, Ben Frost’s “Music for 6 Guitars” Ensemble, and Glenn Branca’s 100 guitar ensemble. The Nent is an Audio/Video project of Berlin based music composer and visual artist Vince Gagliardi. The sounscapes he builds are rised up from the fragile structure of inner emotions, to ultimately collapse into the enormous nothingness of the unknown. in which vast spaces and choking feelings are evoked by beating drums, tuned on a dark palette of sad memories and hollow sounds. but liquid landscapes. The inspiration comes from Siberian shamanism, ecstatic voyages and divinities of the Asian highlands. 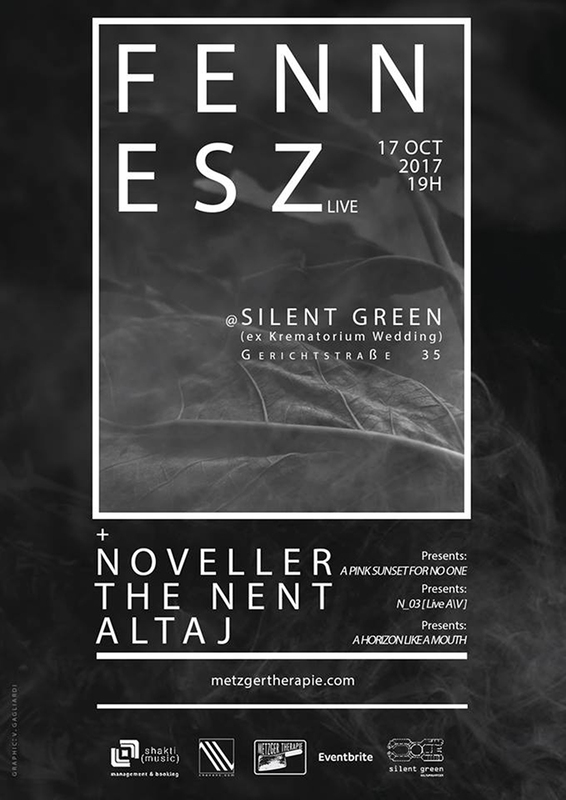 The silent green Kulturquartier is an event venue and an independent project, which has found a unique home in the historic premises of the Wedding Crematorium in Berlin. the intention is to move the boundaries of individual disciplines so that they can be interlinked in new, hybrid forms.